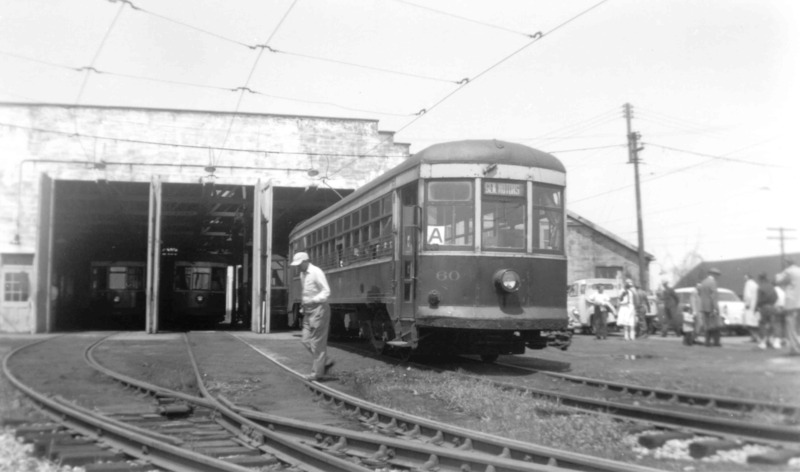 The beautiful, sunny day of May 12, 1956 smiled on all the railfans as they gathered in the early afternoon at the Rochester Subway’s car house. They can be seen milling about in the background at right; the gentleman walking away from the star of this photo, car 60, seems to be one of the fans, too. On this day, cameras will click and film will be exposed in great quantities; not one but two cars would be needed to carry the well-subscribed fan trip that day. Therein lies the story of this photo. Since two cars were needed for the fan trip, hastily-made “A” and “B” signs were displayed in the front window of the fan trip cars, 60 and 66. Here, car 60 proudly displays its “A” sign. Tahe signs allowed the railfans to easily distinguish which car was the one they had ridden on. Several stops were to be made along the Subway so that photographs could be made, and to avoid overloading either car the signs had been deemed necessary. During the fan trip, it may have been found that overloading was not really a problem, and the signs were either removed or blew down; photos made later on in the day do not show the “A” and “B” signs. Our photographer, Shelden King, recalls that at Court Street yard he changed cars. The fan trip car he had been riding, car 66, was returning to the car house but the other car, car 60, would be making one last run to the loop just east of Winton Road before returning to the car house. Car 60’s fan trip outing may very well have been its last under power. After passenger service on the Subway ended in the early morning hours of July 1, 1956, eleven of the twelve cars of the 46-68 (even) series were scrapped. 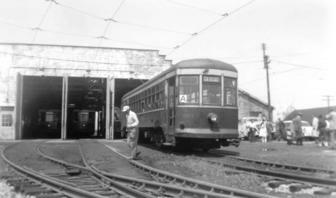 One car, lucky car 60, was donated to the Rochester Chapter of the National Railway Historical Society for preservation. Having no place to properly display the car, the Rochester Chapter made a long-term loan of the car to Rail City in Pulaski, N.Y. When Shelden made a trip to that museum in 1958, he was amazed to find on car 60’s floor the cardboard sign from the May 12, 1956 fan trip, with its red-paint letter “A” still boldly denoting its fan-trip service. In that shop crews certainly would have cleaned this from the car had it been used again in regular service, it appears that car 60 may very well have been run for the last time on that fan trip. Shelden belatedly “cleaned” the discarded sign from the car when he saw it at Rail City and saved it as a memento of the fan trip. That car 60 was the one selected for preservation was explained several years ago by Fred Ruh, a Chapter member in the 1950s. In 1956, car 60 was considered to be in the best overall condition, and the subway’s shop crew selected it for preservation on that basis. Apparently, no sentimentalism was attached to the car for its fan trip service. After a long, circuitous trip back to Rochester via a thirty-year layover in Albany, car 60 is now located inside the Chapter’s restoration building, serving as a visible link to the past.